In a world of constant communication and noise, alternate and disputed ‘facts’, of immediate response and ill-thought through arguments it is tempting to think that one’s knowledge – of almost everything – is greater than ever. The truth is that most of the above-mentioned ‘information’ is both superficial and of dubious value. 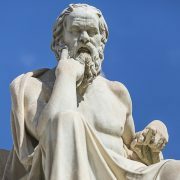 “The only thing I know is that I know nothing” – commonly referred to as The Socratic Paradox. Whilst the precise wording varies, subject to translation, the meaning is clear. Socrates, renowned for his enquiring mind and questioning approach to all matters, suggests that true knowledge begins with an acceptance of ignorance. It also suggests that in seeking ‘wisdom’ from such a position of ignorance one may not know the questions to ask. The philosophic implication is that the enquiring mind should accept and interrogate all available information before arriving at ‘wisdom’ in relation to any topic or situation. It is an approach that can help modern business leaders navigate the turbulent sea of noise, avoid the whirlpools mis-information and seek the knowledge necessary to arrive at reasoned conclusions. Advisory consultancies such as RMK+A do not profess to know everything. However, in our areas of operation, we, at least, know which questions to ask, who to ask them of and how to draw benefit from the years of our experience. More than at any time in our history business leaders are subjected to information overload, conflicting demands and pressure for rapid results. Taking a step back, admitting the need for more knowledge, gathering all the relevant information and taking expert advice, before embarking on action, may be the differential between failure and success.